We were so lucky to have our sister Rebecca and her family stay with us all summer this year. Having them here cooking for Shabbat every week was such a treat, especially since Rebecca and her husband are both such good cooks! Every Friday night, the table as filled with delicious salatim (Hebrew for salads) and appetizers filled with an array of Israeli flavors. One of our favorite dishes they made was our sister’s interpretation of the traditional fried cauliflower with tahini you find throughout Israel. Instead of frying the cauliflower, Rebecca covered the whole head with tahini sauce, and roasted it in the oven. It was so incredibly delicious! The cauliflower becomes super tender, almost buttery, and the tahini sauce gives it a big punch of flavor and just a little tang. Inspired by our sister’s dish this summer, we created this cauliflower steak recipe that can be served as a main vegetarian course or shared at the table when you’re entertaining. 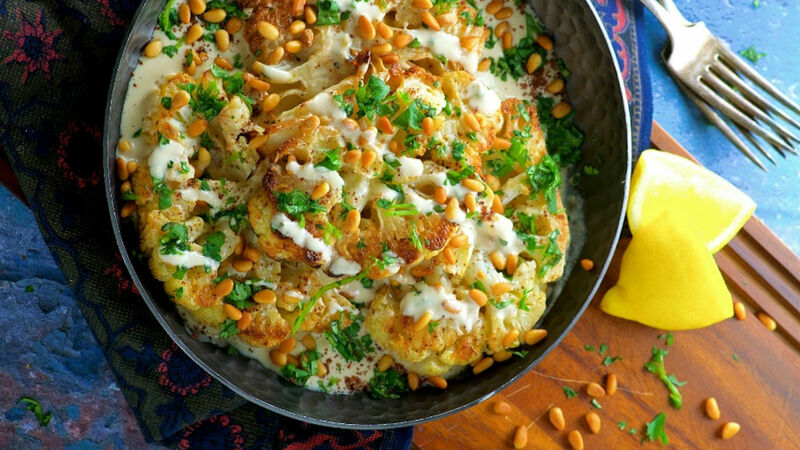 We added some pine nuts because we love how well they complement the cauliflower, and some parsley for a touch of freshness. Remove cauliflower leaves and trim the stem, leaving the head intact. Place the cauliflower on its side on a cutting board. Cut it in half from top to bottom, slice each half in one-inch thick steaks (some florets might come loose. Don’t discard them: You can roast them with the steaks). Carefully brush each side of the cauliflower steak with 3 tablespoons of olive oil and season with salt. Place the cauliflower steaks (and florets if any) on the lined baking sheet. Cut the bottom of the head of garlic (part of the garlic cloves will be exposed; click here for step by step photos). 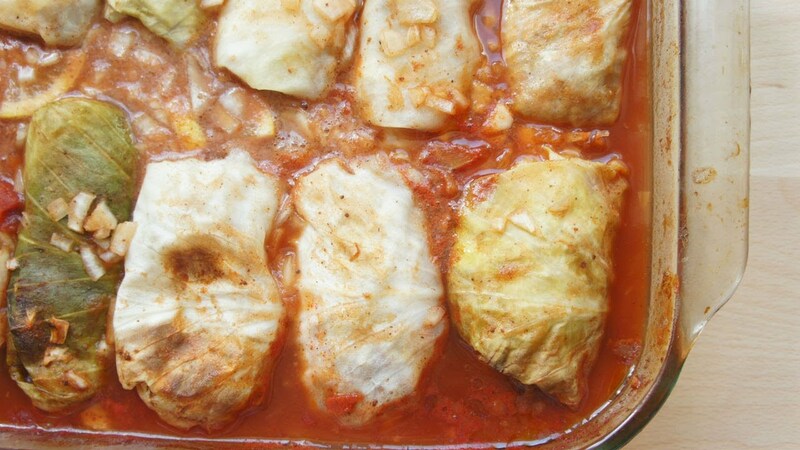 Drizzle it with one teaspoon of olive oil, wrap it with tin foil and place on the baking sheet with the cauliflower. Bake for 40-45 minutes or until the cauliflower is tender. While the cauliflower cooks, prepare the pine nuts. Heat one teaspoon of oil in a non stick skillet. Add pine nuts and saute over medium low heat for 2-3 minutes until golden brown, tossing often (pay close attention, they can burn very easily!). Set aside. To prepare the tahini, whisk together tahini, salt and lemon juice in a small bowl, until it thickens. Add water, 1 tablespoon at a time and mix until well incorporated (for a thinner sauce you can add more water). Once the garlic head is roasted and cool enough to handle, squeeze the cloves into the tahini sauce and whisk until creamy. Refrigerate until ready to use. Note: the sauce will thicken slightly when refrigerated. Allow it to come back to room temperature, or add additional water to thin until desired consistency. Before serving, spoon the tahini sauce on the bottom of a serving plate. 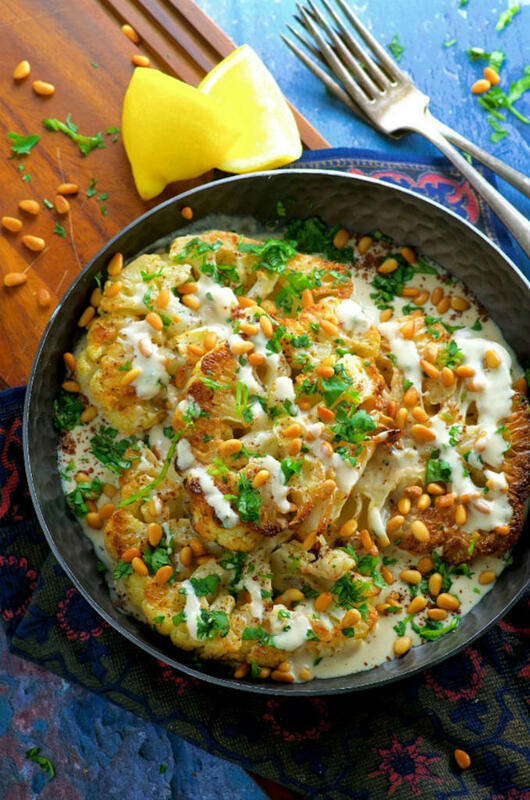 Place the cauliflower steaks on top, sprinkle with parsley and toasted pine nuts.